Erykah Badu is the type of artist whose music and presence has physically altered the landscape of modern music. Nicknamed by the media as the “Queen of Neo-Soul,” Ms. Badu would probably rather be called Low Down Loretta Brown, or Fat Belly Bella, or whatever name she has sensed inside of herself that day. With five studio albums, Erykah Badu has created a body of work that has touched millions and given her the status of a living, walking, breathing legend. As one of the core members of the Soulquarians collective, Erykah Badu brought neo-soul into the mainstream consciousness, changing the landscape of modern R&B. Always adapting and reinventing her sound, in November 2015, Badu released her first mixtape But You Caint Use My Phone, which featured “Cell U Lar Device,” Badu’s much beloved “Hotline Bling” remix. 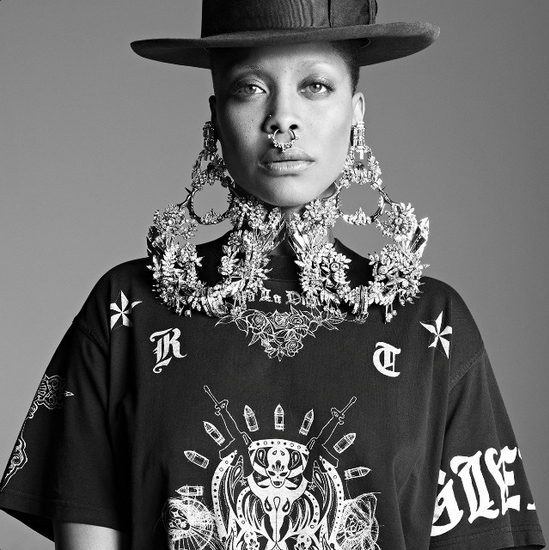 Erykah Badu’s status as hip-hop’s muse is totally unrivalled (yes, we’re looking at you, Amber Rose). Each of Badu’s three children came out of a separate relationship she’s had with a rap legend (Andre 3000, The D.O.C., & Jay Electronica). Beyond that, Erykah had a high-profile relationship in the early 2000’s with fellow Soulquarian Common, a union that inspired some of the best music to come from either artist. Most recently, Erykah and 3 Stacks collaborated on the tasty AF track “Hello,” proving that these two ex-lovers still have an insane amount of chemistry together as artists. It has been reported that all of Erykah’s exes are on good terms with one another, and according to The D.O.C., “there is no hate in that house, we all love one another, and want the best for one another.” Within hip-hop, and outside of hip-hop, we could all learn a thing or two from Erykah Badu.